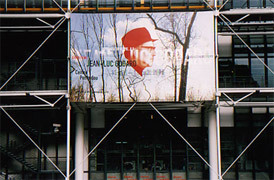 There are three overlapping parts to the Jean-Luc Godard retrospective showing at the Pompidou: a film retrospective of a staggering 215 films (either by or about the cult filmmaker); an exhibition conceived by Godard; and a publication (Documents) which contains previously unpublished or unobtainable film documents. These distinct components do not seek to mirror one another, rather, each takes its own trajectory through the chronology cited as “JLG: 1946-2006”. What follows is my reflections on the exhibition staged in the south gallery of the Pompidou, entitled “Travel(s) in Utopia, Jean-Luc Godard 1946-2006, In Search of a Lost Theorem”. “Travel(s)” can be read alongside Godard’s eight-part Histoire(s) du cinéma (History/Histories of the Cinema, 1988-98) video collage commissioned for television – in particular, as an extension of the final episode, Les signes parmi nous (The Signs among Us). However, here Godard moves beyond the screen, toward the ‘construction’ of a series of spaces in which to house his ‘signs’. This exhibition provokes two main questions: What is the relationship between the moving image and the gallery? And what is the status of the moving image in contemporary (digital) culture? 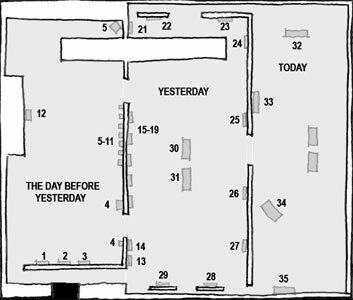 “Travel(s)” is divided into three chronologically defined spaces (or ‘rooms’): “Avant-Hier” (The Day before Yesterday), “Heir” (Yesterday) and “Aujourd’ Hui” (Today). One arrives via the ticket counter in “Yesterday”, with “The Day Before Yesterday” to the left and “Today” to the right. Godard does not force any particular trajectory through these spaces. I have drawn a sketch below to give an idea of the layout (no photography was permitted). This room is dominated by a formless ‘stack’ of architectural scale-models that Godard completed for the “Collage(s)” project. The nine rooms envisaged for the project are intriguing – particularly to see the hand of the filmmaker at work, pursuing ideas in a plastic form. The models look to be a scale of about 1:20, which allows a coherent reading of the ‘could-have-been’ exhibition. The models are complete with the various scaled objects, furniture, paintings, books, texts (on all surfaces) and screens. The thematic rooms were named by Godard. The ‘Malraux Room’ is composed of a miniature projector, standing on a Persian rug, showing Charlie Chaplin’s first film. The attention to detail is impressive. 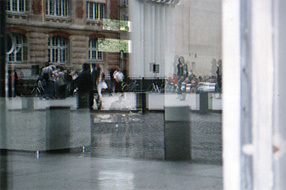 The Chaplin projection loops on a miniDV screen inserted in the scale model while a short text by André Malraux is pasted over one wall. Moving from the space of the models back to the space of the ‘actual’ exhibition, it is evident where key elements and ideas have been transposed to “Travel(s)”. However, many ideas of the (much larger) “Collage(s)” exhibition exist only in their virtual form. A spatial compression (from nine rooms to three) has resulted in many casualties, Chaplin being one of them. Godard’s modus operandi is immediately evident from the ‘unfinished’ nature of the exhibition space, characterised by spontaneity, impulse and ‘the moment’. The wall dividing “The Day Before Yesterday” and “Yesterday” is evidence of an æsthetic of ‘construction’ at play, in contrast to the typical pure and white divisions of gallery space. Here, one is confronted by the infrastructure: timber studs and wall linings. This construction ‘section’ reveals the array of data cabling required to fuel the 31 LCD screens in operation. Here, the elegant typography (Helvetica?) on the walls of most contemporary exhibitions is replaced by ‘scrawled’ hand-written texts and labels. In addition, unfinished paintwork, palettes of building materials and leftover trade tools mark this space very much as a ‘construction site’ for Jean-Luc Godard. Seven small LCD screens affront the excavated wall, which show short films by Godard and those of his long-term collaborator, Anne-Marie Miéville. The linear gallery of films are situated close enough together to blur individual soundtracks and create an ‘audio-collage’. The speakers sit behind industrial steel grates that have been rough-cut into the wall. The highlight here is the new video essay from Godard: Vrai faux passeport (Real False Passport, 2006), commissioned by the Pompidou for the retrospective. This work (of 55 minutes) also plays on a larger LCD screen in the corner of the room, a single armchair provided for comfort. I admit here to gaps in my own viewing due to a limited capacity in the French language. No subtitles are provided. This ‘construction site’ analogy is reinforced with the installation opposite the video gallery by an area cordoned off by a metal fence which displays the famous ‘No Trespassing’ sign from Citizen Kane (Orson Welles, 1941). This is the first of several spaces in the exhibition where the visitor is placed outside Godard’s history of the cinema. Visibility is partially obscured and access is denied. An excerpt from a recent work by Godard and Miéville, The Old Place (1998), screens here. The passage from “The Day Before Yesterday” to “Yesterday” is signalled via a model train that moves back and forth, along its tracks, through a rough-cut arch hacked out from the dividing wall. The exhibition leaflet reminds us of Godard’s metaphor for the cinema as “that marvellous little electric train” or perhaps Orson Welles’ recollection of the Hollywood studio as “the greatest electric train set a boy ever had”. In the central space of “Yesterday”, another gallery of small LCD screens mirror those in “The Day Before Yesterday”. The moving images shown here are excerpts from feature films. These include excerpts from Week End (1967) – Godard’s fin du cinéma – through to collaborations with Jean-Pierre Gorin and (more recently) Miéville. The wall opposite shows films from Godard’s canon of 20th century cinema: films by Fritz Lang, Roberto Rossellini, Orson Welles and Nicholas Ray (amongst others) play on larger widescreen displays. The two video-galleries are interrupted by a central garden sculpture, complete with fake tropical plants, which partially obstruct more screens. If this room is taken as Godard’s (global) cinémathèque, then the green ‘island’ in the middle has been reserved for French cinema alone, with excerpts from his favoured directors: Jean Cocteau, Jean Renoir, Robert Bresson and Jean-Pierre Melville. Near the opening to the next room, a stack of LCD television screens is piled awkwardly atop of one another. Another single screen displays its branded Panasonic screensaver only. Within the ‘æsthetic of the incomplete’, such elements remain banal and silent sculptures. Fittingly, the screen adjacent to this redundant display infrastructure shows an excerpt of Don Quixote (1992), a reconstruction of Welles’ infamous, unfinished epic. It is appropriate if “Today” conjures up the bland/generic names of ‘breakfast media’ programming – this room is devoted to the space of television. Where traces of domestic inhabitation have been evident along the way (unmade beds and the vacated study ‘bureau’), one now arrives within a self-contained “exploded apartment” (6). Here, a matrix of ‘super-sized’ wide-screen LCD television sets compete with each other within Godard’s reconstruction of an ‘economy of attention’. The contemporary experience of the moving image is on display, where consumption of 24-hour digital television, DVD-cinema occurs alongside the technological paraphernalia of home-entertainment-units. In “Today”, these ‘exploded’ domestic spaces are accompanied by corresponding ‘lifestyle’ photomontages of (Wallpaper-style) magazine consumption. A multitude of eclectic ‘tastes’ (which kitchen/bedroom/living room are you?) are presented as collages of domestic space. Perhaps this is a comment on our increasing obsession with the ‘reconstruction’ of interior private space. Or, this might be read in stark contrast to those urban and nomadic characters of Godard’s (New Wave) films, either moving in, moving out or ‘on the run’ from domestic space. Godard has reserved the ‘bedroom’ as the primary site for consumption of contemporary Hollywood cinema. In Baudrillardian fashion, Ridley Scott’s Black Hawk Down (2001) plays on a super-sized widescreen television at the foot of the bed: as a form of ‘reconstructed’ warfare to be consumed within the safe and controlled vestiges of home. The furniture of the ‘living’ space forces focus toward another LCD television screen, which is playing an excerpt from La Môme vert-de-gris (Poison Ivy, Bernard Borderie, 1953). The noir images of Lemmy Caution/Eddie Constantine flicker awkwardly amongst the other content. On another wall, a sculpture of mobile phones graces one wall as an entanglement of phones, cables and miniature human forms constructed from wire. Whilst the courtyard of the Pompidou is visually obstructed by displays, today the vibrant sounds of the Fête de la Musique performances form a welcome intrusion (and reminder) of the city. Godard at the age of 75 (a lifetime which represents almost the cinema itself) is neither prophetic nor catastrophic in his claims for the future of the moving image. Rather, he (re)presents a ‘site’ of exploration, one where Godard’s idiosyncratic history of cinema is nestled within a plethora of other ‘screens’. In Godard’s world, the screens of Francisco de Goya and Henri Matisse share the same space as those of Eurosport and the mobile phone. Too often gallery spaces read as clinical exercises ‘designed’ for easy consumption, where the hygienic hand of the cultural institution wins out. In contrast, “Travel(s)” succeeds in distilling a sense of disquiet, upon exit. Any premonition of ‘Utopias’ is quickly dispelled by inhabiting Godard’s dystopian world, rendered as a series of inaccessible territories, islands and interiors. This installation is a ‘spatial-essay’ that has been projected into the third dimension. The work is typically cryptic, perforated and excessive, and Godard (as usual) places the emphasis back on the viewer to reconstruct their own meaning(s) from the fragments. The tension seems further exacerbated by the contrast between Godard’s ‘construction-site’ and the ‘High Tech’ colourful, streamlined (post-modern) architectural body of the Pompidou Centre. Where a film retrospective usually revisits the past within the dark (and safe) confines of the cinema, Godard instead chooses to situate his own work (and that of his collaborators) within this rhizomatic space of ideas. Once again, there are more questions than answers here from JLG. Jean-Luc Godard, The Future(s) of Film (Bern: Gachnang & Springer, 2002), p. 42. Nathan Lee, “Jean-Luc Godard, France’s Film Provocateur, Directs His Own Tribute”, The New York Times, 25/06/2006. Bamchade Pourvali, in Voyage(s) en Utopie JLG, 1946-2006, In Search of Lost Theorem, exhibition pamphlet (Paris: Centre Pompidou, DAEP, 2006). Rem Koolhaas, “Junkspace” in [email protected]+u, a+u Publishing, Toyko, 2000.